During the program, the participants will be surprised by their own capabilities. The result of making the impossible, possible creates an effective way of thinking that can be applied to many tasks and challenges. The combination of fun, magic, and interaction will ensure your message will remain. Magic in Business provides an energetic boost and the participants simultaneously learn magic tricks that they can apply to their daily work. The beauty of a magical way of thinking that everything is possible! With this positive and productive way of thinking employees automatically become energized and will address challenges with an optimistic view. 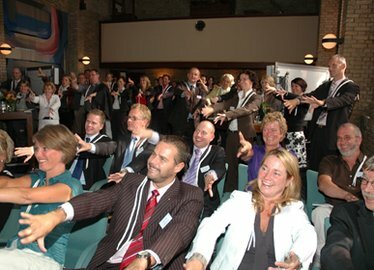 The company trainings and presentations are very flexible and are tailored to your message and objectives. The duration ranges from 30 - 90 minutes. The workshop is suitable for teams of 5 - 100 participants. We will always work with you to define the various options to suit you. Nespresso – Lara Courcelle – CRC Delight Coordinator – Nestlé Nespresso S.A.